First game of the EJC'11 has been settled with a fair Austrian victory over current European champions, in a game where the defenses have been very dominan in both sides. Both teams began a bit nervous in their offensives. The Austrians alternated their three quarterbacks to direct their attack. On their second drive Christoph Gubisch #5 connected a 22 yard pass to receiver Clemens Erlsbacher#1. Erlsbacher #1, himself, converted the extra point (0-7). 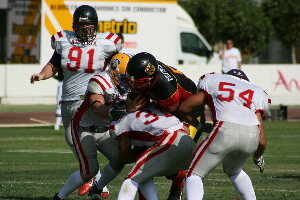 The Germans were unable to react and lost the ball in the following possession after a fumble forced by Thomas Oberdorfer #54, who was designated MVP at the end of the game. Austria could not take advantage of that turnover and in the next play they lost possession with a fumble recovered by Sebastian Wilde #92.First quarter ended without too much sign of offenses on the field and with two defenses that were setting the tone of the game. After a phase of failures from both teams, Germany executed a skillful play that surprised the Austrian defense, coached by Horst Obermayer, and equaled the game.A double pass where Quarterback passed to receiver Eric Nzeocha#84 lateral and this one connected a 47 yards to Aurieus Adegbesan#9 put the equalizer (extra point by Maximillian Reuter was good 7-7). Although Austria tried to take advantage with plays from RB Andreas Hofbauer#8, (77 yds at the end) and top quality receiver Laurinho Walch#6 first half ended with a tie 7-7. Second half began with the ball in Germanic possession but quickly had to punt it. Austrian D-line did a magnificent job today. Austrian did not fail to takea new advantage and after a new connection of 39 yards between Christoph Gubisch#5 and Clemens Erlsbacher#1, they put the ball in the 1yd line. Gubisch#5, with a QB sneak, got a touchdown 7-13. Erlsbacher did not fail with the XP. With 7-14 and without a German reaction, the fourth quarter began. Austria made a great drive that resulted in a 19yd field goal blocked by the German side (Benjamin Barnes #32). This blockade encouraged the Germans as they began to move the chains with the runs of Manuel Engelmman#5 and passes towards Eric Nzeocha#84 and Laurents Mohr#81. At that time, Austrian defense came back and Andreas Lunzer #29 intercepted a pass from Engelmman with 5 minutes to play. Austria tried to sentence the game but another missed field goal gave Germany a last chance with 2 minutes to play but after several individual errors in the offensive line made it impossible. After this game, Austria needs a win over Denmark to make it to the Final whereas Germany needs to win over the Danes and wait for a Danish win over the Austrians.